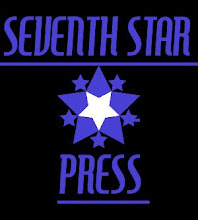 In the Seventh Star Press Spotlight Today - Me! If you get a chance, please pop over to the Seventh Star Press Blog today and check out this week's Blogger Spotlight. Today, we must thank SSP's Michael West a little, as it was a pair of his short stories that initially brought Bob Milne of Beauty in Ruins into regular contact with SSP. Since then, SSP has been honored to have been on Bob's site with several of its authors on tours, Amazon Free Days, reviews and other activities. Beauty in Ruins is a first class site run by a dedicated guy with both a love for speculative fiction and an openness to independent and small press releases. You can't ask for anything more than that! So proceed forward and visit with the main man at Beauty in Ruins, Bob Milne! A huge thanks to Stephen for inviting me to take the spotlight today, and to Seventh Star Press for being one of those publishers I continue to get excited about.